Digitally transform your business rapidly and accurately with DRS. Document conversion to microfiche or microfilm for archiving, or placing electronic versions on CD, DVD, Cloud, or ECM for easy access and retrieval has benefits that drop directly to the bottom-line and reduce costs. Operations are streamlined and productivity is increased. In today’s world, digitally transforming your business and having critical documents secure and accessible is good business. Backfile Conversions and go-forward document scanning (Digital Mailrooms) are a DRS speciality. 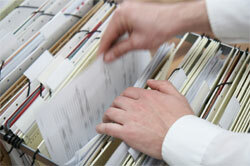 We scan and convert millions of documents each month. We have completed over 25,000 projects that testify to our expertise and knowledge. Your Place or Ours? You can Still Benefit from Affordable Document Conversion and Imaging. DRS has convenient eastern seaboard imaging centers available for backfile scanning, imaging and document conversion, which run around the clock and process huge volumes of information. If you prefer that document conversion be handled at your facility, our mobile solution will go to you and provide everything necessary. Just one call on your part and the wheels begin to turn. It Costs Less than You Think to Take Advantage of our Experience and Expertise! With over 50 years of experience and advanced technology, DRS provides extremely competitive pricing for document conversion, imaging, scanning, and archiving. You can trust us to get the job done on time with the best accuracy you can find. We can even securely destroy the original documents if you wish. No matter what your requirements are, DRS can make it happen.